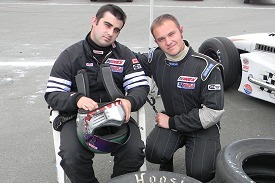 We started off with one goal in 2006; to win the road course Semi-Pro Championship. While the goal was fulfilled, the journey was tumultuous. Following a strong 2005 season the foundation had been laid for success in 2006. With the short off season the road racing series affords, preparation was swift. The first race of the season seemed to set the tone for the rest of the season. A series of lows and highs that make racers appreciate the winning of championships. 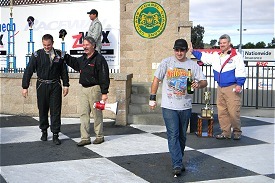 The February race at Infineon was the kick-off event of the season. While practice & qualifying were held in the raining conditions, the touch of the painted curb in qualifying sent me through the wet grass and crashing heavily into the concrete retaining wall. The car sustained heavy damage to the left front suspension and even sheared off the front valve cover bolts. With the thrash to get the car to a state of race ready, the car was ready to go for the afternoon race. 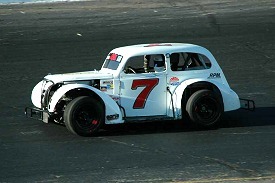 After making my way up to the top of the semi-pro rankings a broken camshaft put the car into the pits again. The work of my dad replacing the camshaft in the night hours, again allowed the car to be ready for Sunday's race schedule. Sunday was the type of day that we had hoped for in our preparation. 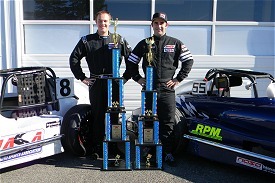 I qualified second only 0.438 seconds slower than my dad on the pole. 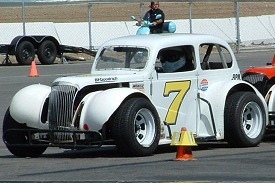 The race went well as I was able to race with my dad wheel to wheel for several laps, and beat him to the line taking the overall victory. 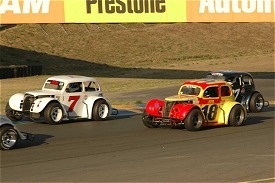 The next month's event at Thunderhill Raceway Park again showed that winning the championship would require determination and desire. 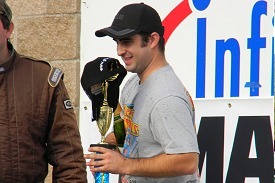 While Saturday's event produced another Semi-Pro win, a blown engine on Sunday sidelined the car again. 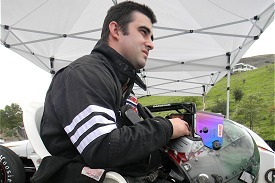 With only three weeks before the next race, the blown engine combined with the roll-over accident suffered by my brother, Ryan again showed that work and persistence were going to be the keys of success. The short time span allowed us only enough time to purchase a used car for my brother to get him back to the track, and install the only spare engine we had into my car. This lead to the lowest point of the season, the spare engine blew on the 2nd lap of practice sidelining me again without earning a single point for the weekend. The next several races things started to settle in and I was able to earn 5 more wins and three 2nd place finishes over the remaining races of the season. As I headed into the INEX World Finals, my expectations were high and the ultimate goal of winning the championship hinged on a successful weekend. Throughout the practice sessions I was running in the top five on the speed charts. 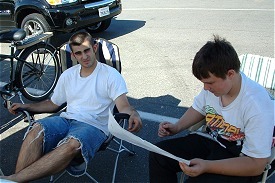 My brother and I started on the front row for our first heat. I was able to take the lead and running comfortably in that position, until a shift fork in the transmission broke, relegating my car to be stuck in 4th gear. I was still able to maintain a top ten finish in heat one, but with the limited time between heat races, it looked like a rear of the grid start coupled with only having forth gear would be the downfall of the weekend. In a stroke of luck, darkness fell before the second heat race could be started on Friday evening, which allowed us to remove the engine, replace the damaged transmission and shift forks and have it ready for Saturday's second heat race. As I was sitting on the grid warming up the engine, the oil light came on. I climbed out of the car, and under the engine was a large oil leak. A quick trip back to the pits to tighten a loose oil line and replenish of the oil level, I was able to finish well enough to have a mid-pack main event starting position. As the race started I was able to work my way towards the front of the field getting as high as fifth before contact with another racer bent a spindle. The bent spindle created a severe under-steer which made it difficult to stay within the top ten. Ultimately, I was able to finish the INEX World Finals in the seventh position, which left the championship title victory margin of a scant 2 points. I would like to thank my Mom and Dad for allowing me the opportunity to participate in such a good sport and great series. I also need to thank my brother for being my most consistent competition, and my grandparents for their support. Ken McRorie, Rob Cantrell, "Big John" Peterson for all of the help on the car over the years. 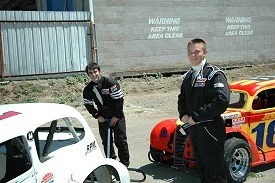 Northern California NASA for promoting a great series, where we race on some of the world's finest race tracks. 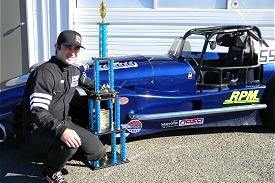 I am proud to be a champion and represent INEX as the Semi-Pro Road Course Champion.